Paragliding adventures of a pilot flying XC in competitions and scoring in the "top of the middle third." 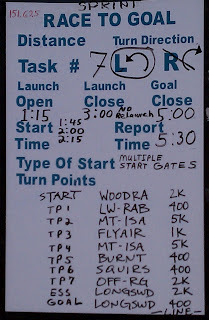 Flight descriptions, Competition tips, recap of results, and US competition schedule. Today was a day similar to yesterday. The Rat treated us well and the valley winds didn't kick in until shortly before most made it to goal. 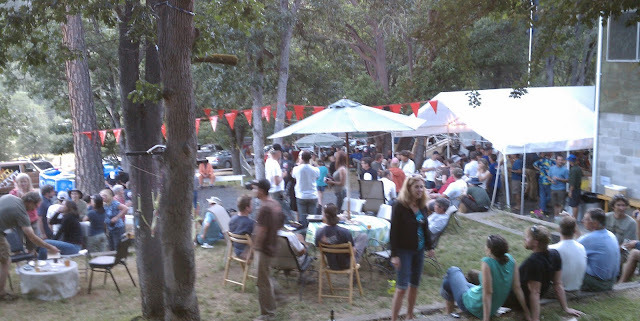 The Rat Race had just less than 30 pilots into goal at Longsword Winery. 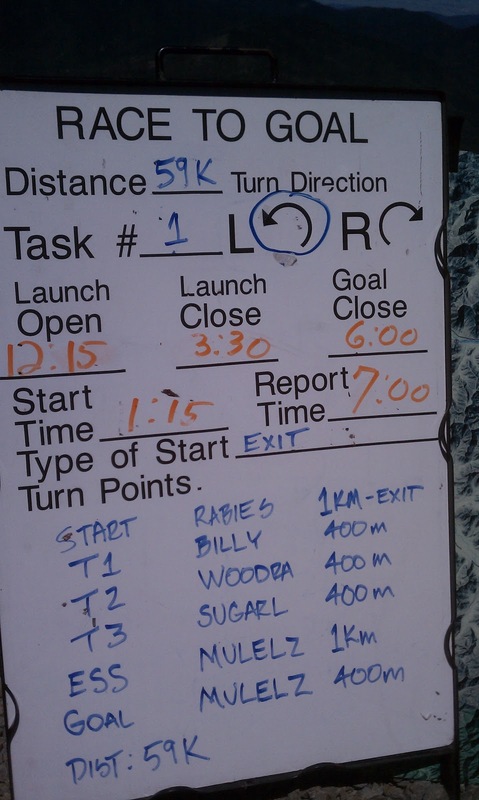 The Rat Race task was from Burnt Ridge to Prospect Ridge to Burnt to John's Peak the back into the valley to Longsword Winery - about 73km. I launched as soon as the window opened and had an easy climb over Woodrat Peak and made the early transition to Burnt to scope out the lift in the area of the start cylinder. 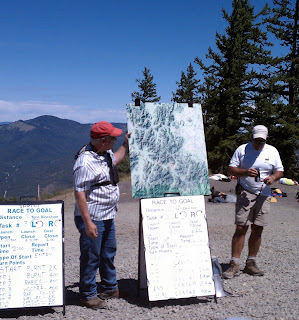 Soon the air got crowded over Burnt as we mapped out the convergence for the start. About 10 minutes before the start I blundered away from the rather fragmented gaggles just long enough to find a massive sinkhole and put myself in a low position during an obvious down cycle. Many good pilots were struggling to stay in the air. I found myself a bubble at about 200' below mid launch and worked it patiently until it bloomed into a 450'/min. elevator back into the start gaggle. 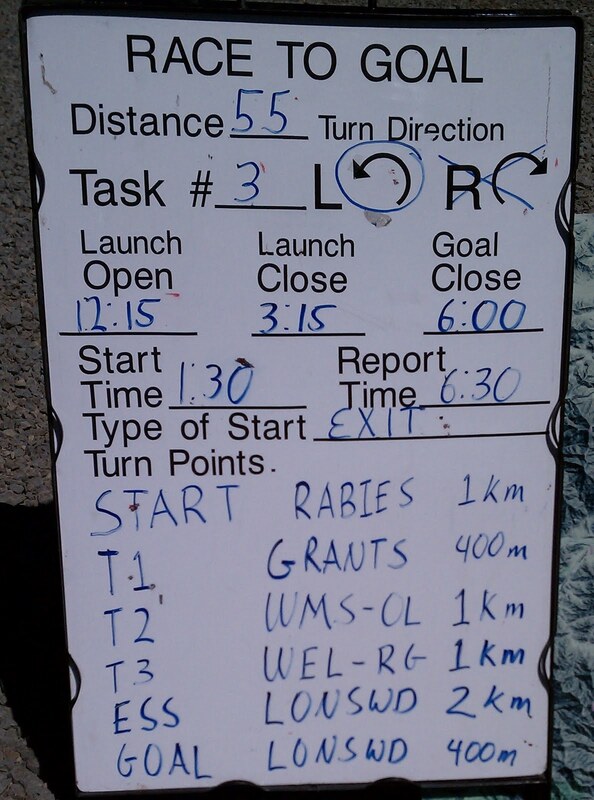 I was very fortunate to make a reasonably decent start into Rabies for the leg to Prospect Peak. The thermals were good sized and strong as we proceeded North. I had vowed to get to goal today so my progress was deliberate and I remained high for the most part. For those who were high the lifty lines were easy to see while watching the pilots ahead and below. The high cirrus clouds that had been approaching from the North West shaded the Prospect Peak area as I approached so it was very important to take a good climb before heading out to tag the cylinder and allow for the return to the ridge. At this point I joined Jug and Szilard and we worked together. Soon small areas of sun appeared on the terrain and we found booming climbs that made the return leg to Rabies fairly quick. The leg from Burnt to John's Pk. was a slow tip-toe until we found a nice climb with a helpful hawk that calmly showed us the best core. I headed into the turnpoint at John's and returned the 3km. to find the same climb. When I got to the area of the climb the same hawk was still orbiting to show us the climb. After that climb I rolled out with a 6:1 glide to goal and saw Jug and Szilard below and slightly ahead so I pushed full bar and chose a very lifty line to get to goal. Every core I flew through gave me a lift, even while holding full bar, and I was getting around 10:1 glide. I had such a lifty line that I was at least 2000' too high at the end of speed section. I placed 15th (tied with Szilard because he beat me by 8 seconds, but I had more leading points) and this was my best showing of the week. The day was won by Nate Scales, followed closely by Josh Cohn, Matt Beechinor, Matt Senior and Nick Greece. The Rat Race had 26 in goal and the Sprint race had 42 in goal today - Many happy pilots at the Longsword Winery! I just got in, after a 10 hour drive so that's it for now. Here's a great video of the Rat Race this year. Below is a photo of the festivities at RRHQ just prior to the awards ceremony. 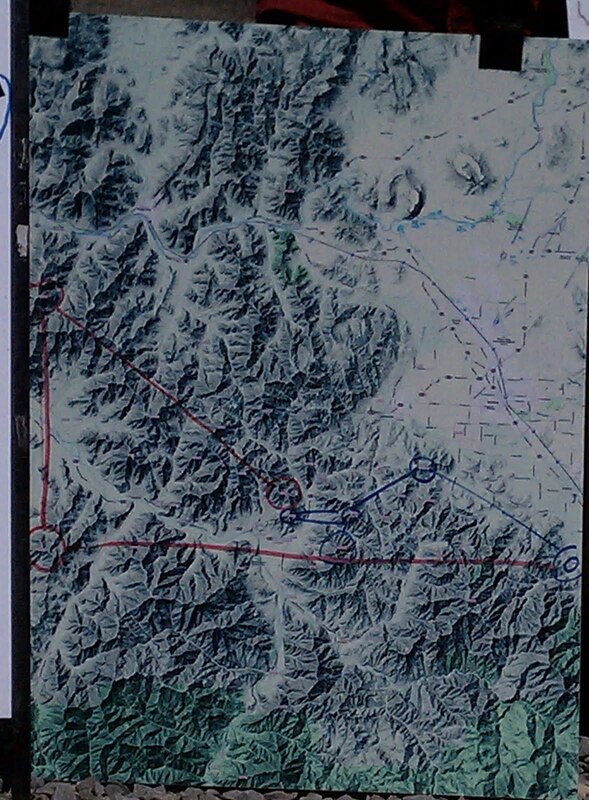 I had a very good start and the first leg to Bald was lots of fun with some ballistic climbs and nice lines along the convergence. Those who mapped out the best lines had significantly better transitions than those who allowed themselves to get low in the cascading backside of the convergent shear. I was running well, watching Jimmy and Hayden duke it out for the Serial Class title. 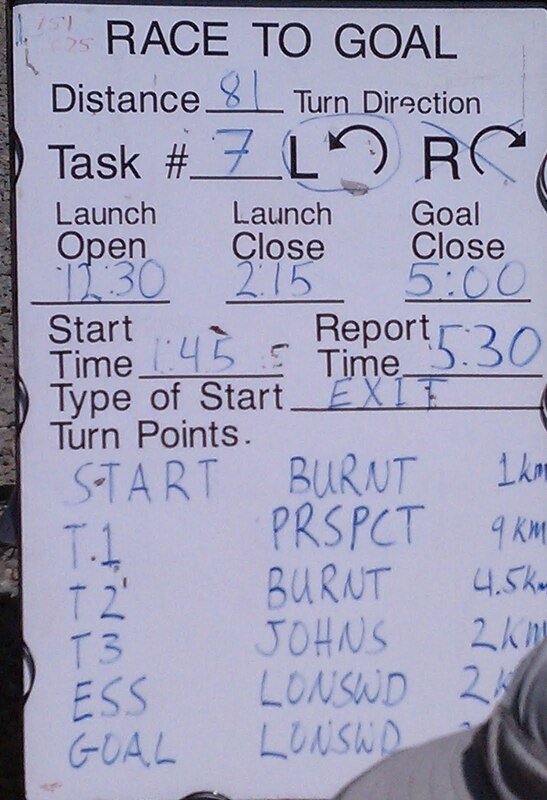 My climbs were good and made fast time until I got to Burnt. At this point I lost Hayden and Jimmy and had to change gears for the transition to John's. The Jacksonville area and Medford Valley were producing thermals, but they were more fragmented and much weaker than those we'd flown in for the first two legs of the flight. I felt that I had set an appropriate pace for the conditions, but left one very unproductive bit of lift to search for better - only to watch in vain as the glider in the bit-o-lift started to climb well, behind me. I tried to return to the climb but the bubble wasn't found and I was soon setting up to land 8km from goal. Some of the R-11/R10/Boom8/UP Edge armada rolled into John's with sufficient altitude to make a balsy glide to goal and squeak over/around the hill just prior to Donato's field. The photo is at Donato's LZ. 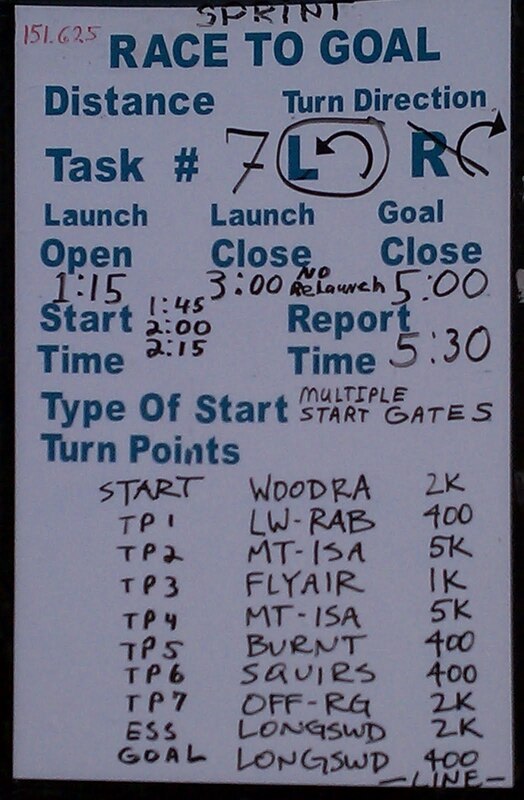 33 pilots made goal today. It's Saturday morning now, and the day looks similar to Friday, so I'm looking forward to a great final task. The skies were overcast, the hills were obscured, and the temperatures were chilly when we awoke this morning. All the forecasts were indicating an improvement could be expected so the collective headed up the hill. As forecast the day was a good Woodrat day with convergences to be exploited and winds to contend with. 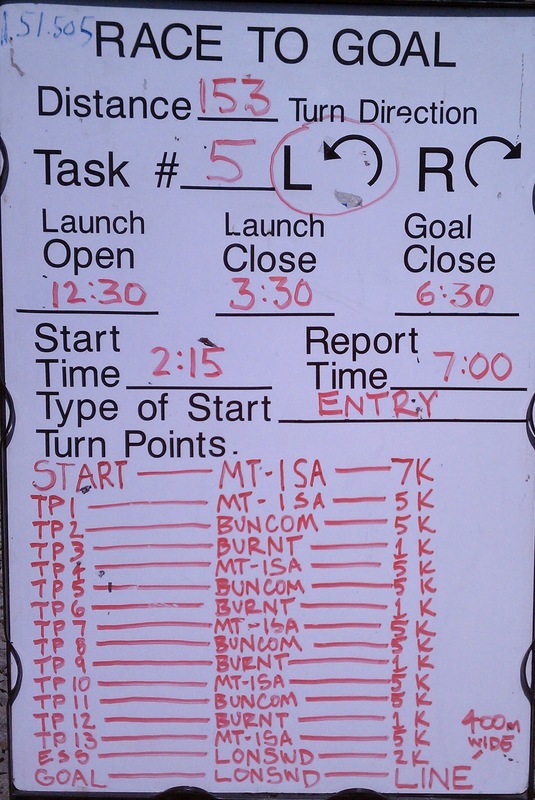 The task committee called an task that had the race group start at Mt. Isabella and then to just past Squires to Burnt - repeat. . . 4 times. The sprint group also did some similar laps. 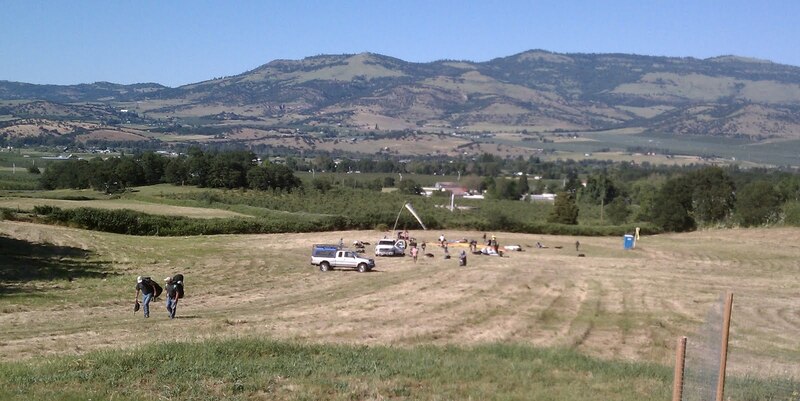 The task made for some amazing views to the spectators at Longsword Winery which served as goal for both races. I had a good start, getting high above Rabies Pk. and making the first turnpoint at Buncom in good time. The rest of the flight was enjoyable, but uninteresting because I took myself out of the race to fly without the distraction and hazards of flying with the extremely packed gaggles in the valley. The pilots that flew the course had good flights and some very exciting racing. One of the great features of the Rat Race is the generous mentoring going on during the days and evenings. 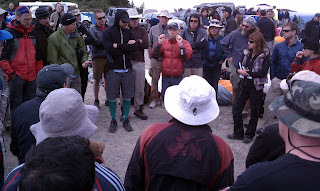 Nick Greece held daily impromptu Q&A sessions on the hill and the group grew from 6-8 a few days ago to 20-30 today. Shown is Eric Reed offering some hints. Another amazing feature of the Rat Race is the number of helpful volunteers at the race. Without these folks the race just wouldn't work. I found a glass of wine and a good seat at Longsword for the race finish and watched as Dean Stratton won the day followed by Josh Cohn, Matt (farmer) Beechinor, Nick Greece, and Nate Scales. Today looked like another good day at Woodrat Mountain. The forecast for the day indicated that lift would be to 6000’ and winds wouldn’t be too much of a factor until late in the afternoon. The task committee went with a suggestion that a “do-over” was a good idea. The task was yesterday’s task modified to include Grant’s Peak, then to Williams Overlook, to Donato (South in the Medford Valley). I launched shortly after the launch window opened and climbed up above Woodrat Peak to the inversion, which was fairly low. It was also obvious that there was considerably more wind than on previous days and than forecast. The progression across the valley to the start cylinder at Rabies Ridge was not a simple one climb transition for many, since the headwinds were strong and the climbs were low. I managed to cross with a few friends and we soon found a nice thermal - nice, only because it was better than the alternative. The truth is that the climbs today were weird, one-sided, meandering, shards of lift punctuated with areas that can only be described as ‘holes’ where the wing wasn’t really flying but rather, quivering and hovering in the white-water like conditions. Once the start-time arrived, it was on to Billys to work our way to Grant’s Peak as we did yesterday. The into the wind performance of the 2011 2-liners is amazing. I’ve not seen a time when the performance of the latest comp ships was so noticeable when compared to last year’s model or the latest hot Serial Class wings. What this meant today was that a few of the 2-liners were able to make a transition past Humbug canyon that the rest of us found to be quite a slug-fest. The task winners got 98 points - those of us who flew and fought the fight to Humbug only to decide to land in the valley next to the Applegate Store got 55 points. The Sprint race was cancelled before the start. It's cloudy this morning (thursday) but forecasts indicate that it may be a day. Today's task was a great use of the day - Conditions improved as we headed North to Grants Peak allowing climbs to 6500-7000'. The lead gaggle was playing it cagey - conservatively working towards Grants Pk. at a pace that allowed me to make up for my 8 minute late start. I joined a couple perfect thermals that put me into Grants in touch with the lead gaggle. After Grants Pk the leg to Wellington Overlook was the crux for most of us. The lead gaggle headed across to Prospect Peak with dismal results. They were just far enough ahead that I and a few friends bent South and slid into the Williams valley with few options. We all eventually landed in the valley, at 30-35 Km. Those who stuck to the high ground on the East side of the valley, or even headed directly to the Wel-ol turnpoint had better success. The top 10 included at least 6 Serial class wings because the line the lead gaggle took was much slower. Congrats to Peter Warren for winning the task on his Ozone Mantra M4! The China Gulch field that I landed in yesterday had three wings in it today. It was confirmed to be a tight fit, but all pulled it off. We had one injury that involved a tree landing somewhere on the Rabies Ridge. Running short on time this morning so that's it for now. It looks like a nice day again so we are heading up the hill. Today’s Rat Race task was a 62Km task with 2 crossings of the Ruch valley and then a beat upwind to John’s Peak (North of Jacksonville) then a downwind leg to Immigrant Lake via Donato. A restriction of 6000’ in the area of the Medford final approach corridor. 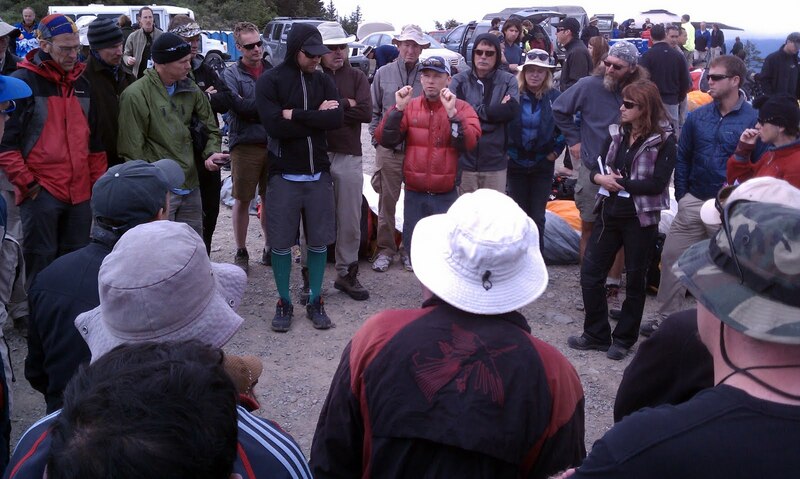 Many of us got into the cue early and got up at Woodrat Peak and were bouncing off a rather snotty inversion at 5200’. Rather than bounce around at the top-of-lift and wait for another 50 wings to form under us, a group headed across the valley to the start cylinder at Rabies Peak. We had 45 minutes or so to kill so pre-positioning seemed like a smart move. The conditions, upon arrival at Rabies Ridge were dismal. I found myself low on the ridge and fought for 15 minutes as I slowly worked my way down to a height that required an approach to landing. Here’s the short list of absolutely stupid things I did and how I feel my decisions should have been changed. I tried to make an early transition while flying with R11s. They will always have more time and options upon arrival at the ridge. Try to make tricky transitions with wings that have similar performance, so you have friends at your altitude. I put myself in a committed position that slowly (insidiously) put me on the leeward side of the ridge, with limited landing options and dismal flying conditions. I had never been low in this area (China Gulch) before, and really didn’t want to be there - but I put myself there. Dumb, Dumb, Dumb. Once it became obvious that I was loosing ground (altitude) and facing a glide into a shallow ‘gulch’ with a couple of useable LZs, I allowed myself to fight until only one, marginal LZ remained available to me. As I got closer to landing, it was obvious that the LZ was short, downhill, had wires at the end. None of these things were unknown to me, but the combination was much tighter than I expected. The approach was over trees and very critical - overshooting wasn’t and option. In retrospect, this LZ was unusable. The consequences of a low hit, a pop of lift, or any rotor, while maneuvering as close to the obstacles and stall point were not pretty. Once the ‘gravity’ of the situation was fully realized (what had I been thinking?) I managed to fly around one oak tree, through a narrow gap (not a wingspan wide) and then used the ‘butterfly’ method to make the wing draggy enough to get down in the remaining *downhill* field. Fortunately I know this wing (Avax XC3) well, it’s an honest wing that allows tickling the edge of stall. If this plan hadn’t got well - The options were a tree, wires, or parachutage from 15 feet. Fortunately everything went well and I walked away with an intact body and kit. 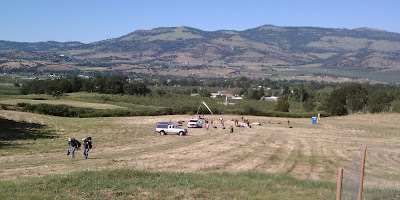 Meanwhile, those that made the start, were working their way to John’s Peak and found that the entire complexion of the air had changed in the Medford Valley. All dirted on the way to Immigrant Lake. No one made goal today. There were some fun stories told around the HQ this evening. 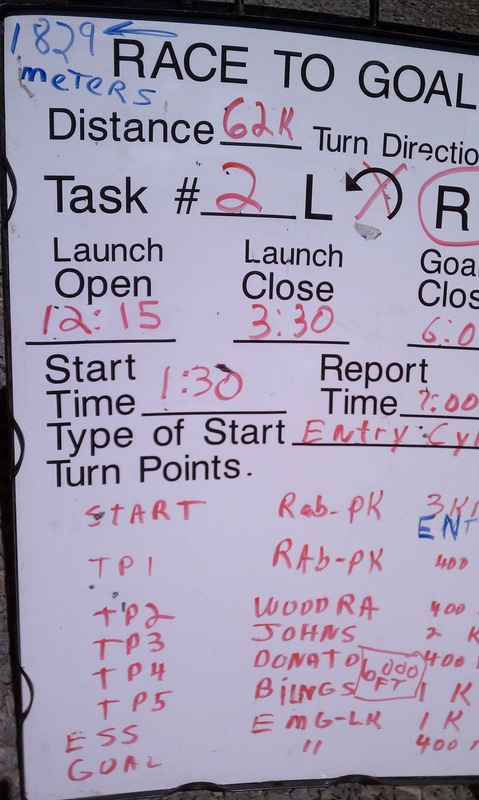 A couple of the top pilots had incorrect radii on the Rabies Pk. Another forgot to tag Woodra before heading to John’s Peak. And another had to go back to tag the missed Donato point. Winner for the day was Nick Greece, who made it 50Km. 2nd was Farmer, 3rd was Nate Scales, 4th Hayden Glatte on a Serial GTO, 5th was Josh Cohn. No one made goal in the Rat Race task. 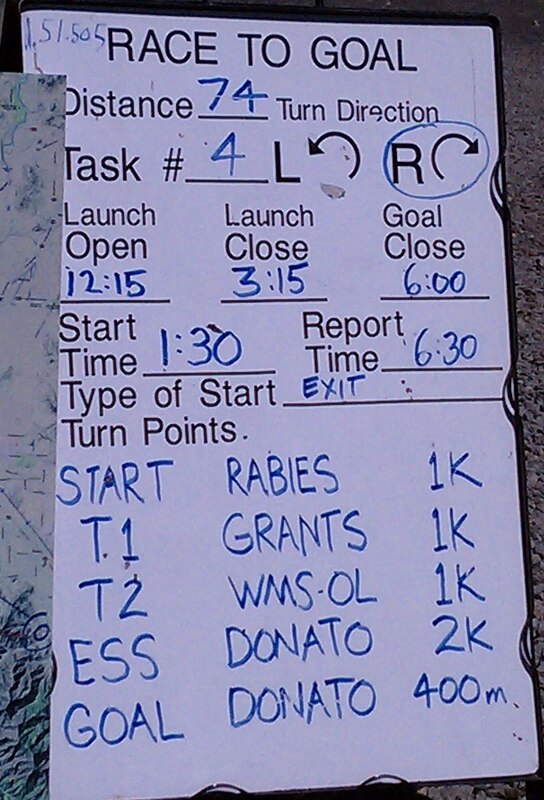 The Sprint race was a 27 Km task that stayed close to Woodrat and ended at the same goal field as yesterday. The weather improved today and it was a fun day of flying. Classic Woodrat convergence and occasional snotty air, but the afternoon valley winds that everyone was waiting for, never materialized. This year the Rat Race has two races running concurrently - The SPRINT race and the RAT RACE. The SPRINT task was 19K and the Rat Race was 59K. I am flying the longer tasks. The start cylinder was across the valley and an early start was important. 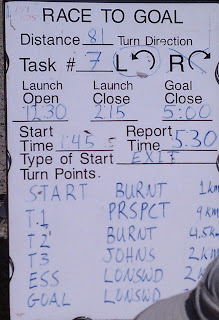 The launch cue was very slow for quite a while and I got a late launch and paid for it with a start at least 10-15 minutes behind the lead gaggle. No worries - Lots of company. The first 30km of the flight went well and I was able to make up a bit of time without getting myself into a hole or too alone. The lift was dependable and strong with the occasional slapping around in the convergence. After crossing back from Woodrat Mtn. 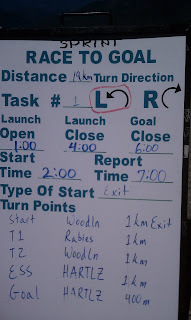 to Rabies for the last push into Sugarloaf Mtn. I was hoping that I was early enough to avoid the strong North or West that had a chance of developing. No strong winds were encountered, but there were some seriously sinking areas the went of for an eternity. Sink of 2000 to 2400'/min. were not uncommon and put me in the position of not wanting to push bar because the wing was fluttering in the trash, but needing to push it just to escape the sink. For many who view paragliders, they seem like big, slow jellyfish - unable to do precise and exciting things. But for those who have the skills and cajones to do acro, these little buggers can do a lot. Showtime from francois ragoski on Vimeo. This site has evolved from a diary of my flying experiences to what you find today. If you are a student of XC paragliding or interested in some of the technical aspects of competition flying, there are some resources here. You can visit the "ARTICLES" section or do a word search. If you find a subject that you would like to follow, use the "LABELS" links at the end of each post. If you are just browsing, feel free to explore the "Blog Highlights" in this column below. Is Bear Grylls an Idiot, or What? In my spare time I fly paragliders for fun and compete in XC competitions. I also throw pots to vent my creative juices in my ceramics studio. San Luis Obispo Soaring Assn. © Tim O'Neill. . .. Powered by Blogger.